Every once in a while a wedding comes along that has all the elements to make it a classic: a bride with impeccable style, a cathedral length veil, tuxedos & bow ties, a cream & white & gold color scheme, and a traditional ceremony in the prettiest chapel in Mexico. This Vancouver couple’s Mexico destination wedding at the luxurious & exclusive One & Only Palmilla was also filled with timeless moments – the father of the bride’s happiness at seeing his daughter in her Vera Wang wedding gown for the first time, the groom’s emotional reaction at the alter, and my favorite, the couple’s pure joy at being husband and wife after their ceremony! For this image, Chris placed a Canon 600 EX-RT Speedlite flash on the floor of the chapel to light the couple in the dark interior of the Palmilla wedding chapel. 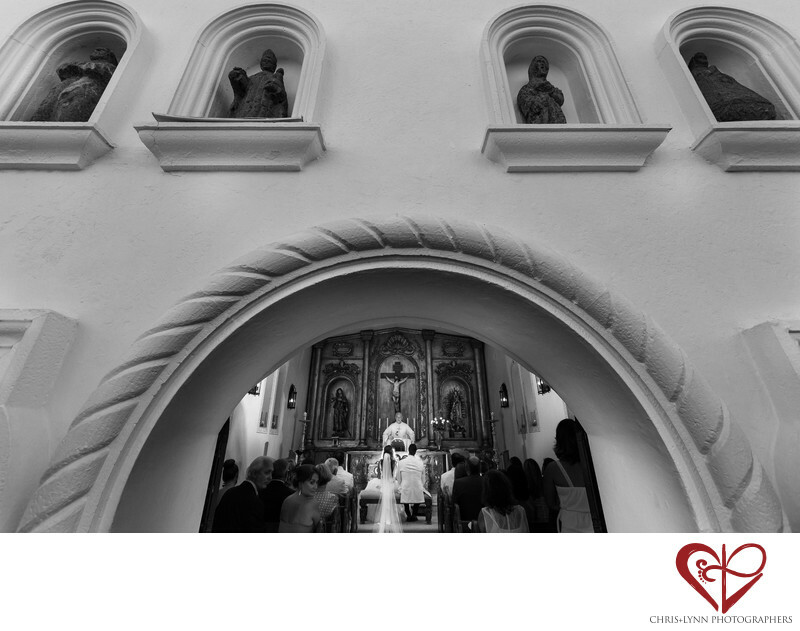 He shot from the top of the stairs outside the chapel with a Canon16-35mm lens mounted on a Canon 6D full-frame camera body in order to see some of the detail of the chapel facade and frame the couple's ceremony vows with the distinctive arched entrance to the chapel. A Canon Speedlite ST-E3-RT radio transmitter was used to trigger the flash remotely from outdoors.